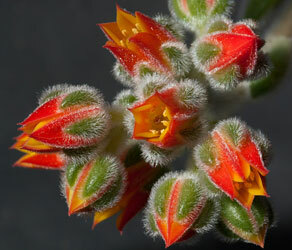 Many succulent flowers are much smaller than cactus flowers – but when you look at them closely they are both interesting and beautiful. 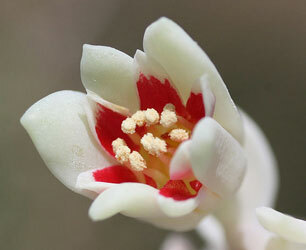 The pictures above were taken using a close-up camera lens to show detail which would not usually be seen. 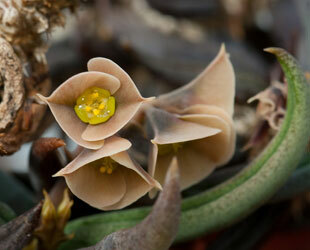 Lithops, or stone plants belong to a large group of plants known as Mesembs. 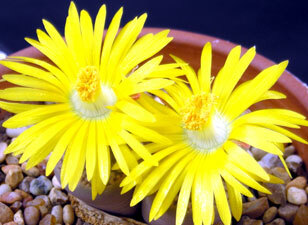 The plant on the left is a Lithops, which always have yellow or white flowers. 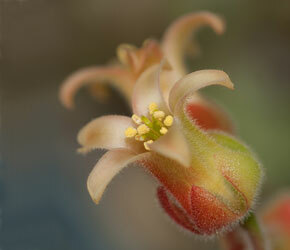 Other Mesembs might have yellow, white, orange or magenta flowers. 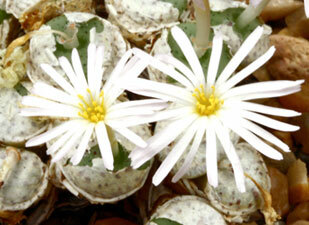 The plant on the right is a Conophytum, sometimes known as dumplings. They also make new bodies every year. You can see the new bodies bursting out of the skins of the old ones in this picture.